"This crisis is bound to make our relations stronger." 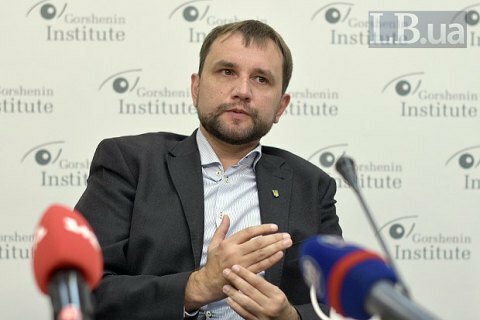 Ukraine has for 25 years adjusted its history to the preferences of neighbouring countries but they have to realise that the situation has changed dramatically, historian Volodymyr Vyatrovych said at a roundtable on tensions in Ukrainian-Polish relations, which was organised by Gorshenin Institute on 17 November. Vyatrovych, who is the head of the Ukrainian Institute of National Memory, suggested that the Polish leadership should realize that Ukraine has become a subject in matters of historical memory. "It is strange indeed that every day a foreign minister makes statements that would better suit a teacher of history, [Witold Waszczykowski] speaks almost exclusively about the history of the country," the historian said. Vyatrovych described as "strange" the attempts to tie the current Ukrainian-Polish relations to the way Ukrainians interpret their history. "It's even stranger to hear his threats to ban Ukrainian officials including myself, from entering Poland because they allegedly prevent tributes to Poles in Ukraine, although the only thing that the Polish side has to do is to comply with Ukrainian law on the Ukrainian territory," he said. The historian noted that Poland for 25 years has acted as if Ukraine did not exist, notably in matters of historical memory. Still, Vyatrovych is optimistic about the future of relations between the two countries. "As a result of this crisis, which we undoubtedly experience, the relations will become stronger. On the one hand, I am convinced that our Polish colleagues will understand that they are dealing with a subject to be reckoned with. On the other hand, Ukrainian politicians should abandon the infantilism that they demonstrated talking of Poland as an advocate of Ukraine in Europe as if Poles were obliged to always protect us," Vyatrovych said. The historian added that one of the biggest achievements of cooperation between the Polish and Ukrainian Institutes of National Memory is the Polish-Ukrainian Forum of Historians, the sixth meeting of which is scheduled to be held next March in Poland. "There is still no certainty whether this event will take place, but the Ukrainian National Memory Institute will make every effort for it to take place," Vyatrovych said.